1. ﻿﻿Where is the race course? 2. What about the courses? The 5K is also a flat out and back with a turnaround at the Cleveland Metroparks Chalet by the toboggan chutes. 3. What are the directions from the nearest highways? From the north or south take I-71 to the Pearl Road (Rt 42) exit. Head west on Pearl Road for less than a mile to the RTA parking lot, which is next to the entrance to the Ohio Turnpike. The RTA parking lot will be on the south side of Pearl Road. The RTA parking lot is approximately 1/2 mile to Bonnie Park and the start. Note that due to limited parking at Bonnie Park and the race course logistics, the primary parking location is the RTA lot. Internal park roads will be restricted access around the race time. If coming from the eastern or western suburbs take the Ohio Turnpike (Rt 80) to the Pearl Rd (Rt 42) exit and follow the above instructions. Separate awards ceremonies to be held at the Bonnie Park Pavilion as soon as practically possible after the majority of the winners are determined in each race. Water and Gatorade will be available at approximately the halfway point and the finish of the 5K. Water and Gatorade will be available seven points during the half marathon and at the finish. Yes, at the pavilion in Bonnie Park. Runners must provide their own bag. It is recommended that you do not put valuables in the bag. Parking is available at the RTA parking lot at the corner of the entrance to Rt. 80 (Ohio Turnpike) and Pearl Road and the Mill Stream Run Archery Range on Albion Road. 9. Where and when is packet pick up ? 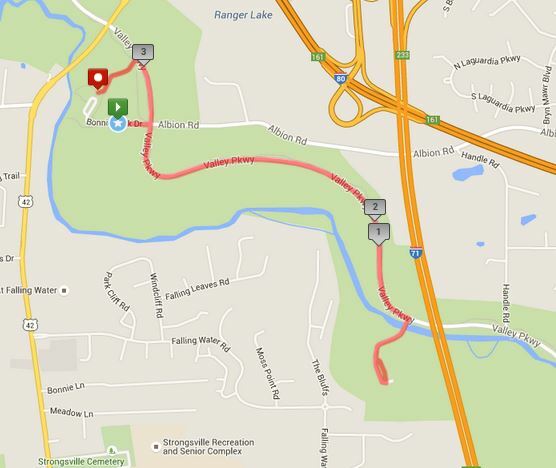 There will also be day of race packet pickup at the Bonnie Park Pavilion starting at 7:30 a.m. The Bonnie Park Pavilion is located off the Valley Parkway at Albion Road. In person registration will be held during packet pick up periods on Friday & Saturday. NO DAY OF RACE REGISTRATION. 10. Are walkers welcome to participate in the event? Participants who are finishing at a later time may be asked to move onto the parallel paved all purpose trail and will still finish at the same point as all other participants. This is dependent on the precise time when the Metroparks rangers require re-opening Valley Parkway to vehicles. There will be an early start (08:15a.m.) 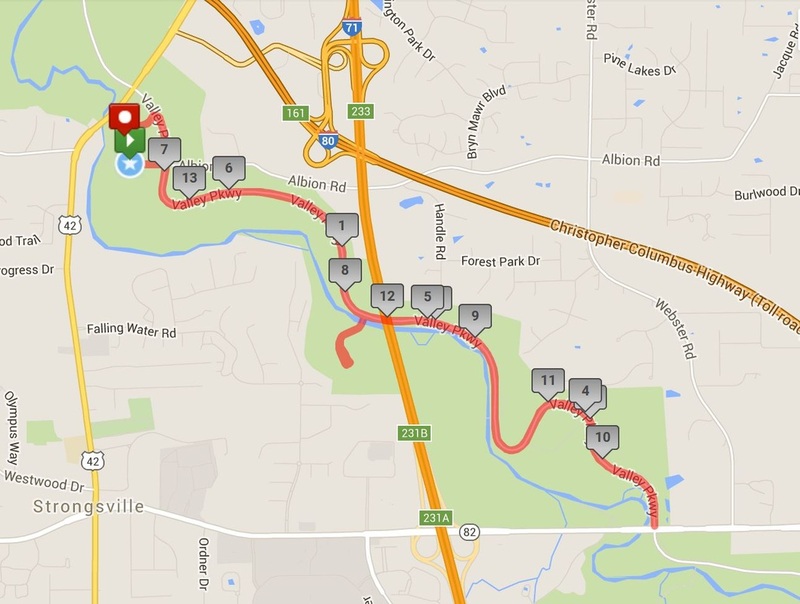 for walkers and runners who do not believe they can complete the course in under three (3) hours. 11. Will there be port-a-johns? Yes, at the Bonnie Park Pavilion (which is near the start/finish and halfway point of the half marathon) and two other spots on the course if weather conditions permit. 12. Do the proceeds from the race support any cause? 13. What sets the capacity limit for the race? What determines a "sell out"? The maximum capacity for the race is set by the Cleveland Metroparks based on their assessment of the number of people, cars and traffic that section of the park can accommodate and that limit is around 1,000 participants on the day of the event.